WE HAVE THE PERFECT GIFT FOR FATHER'S DAY!! 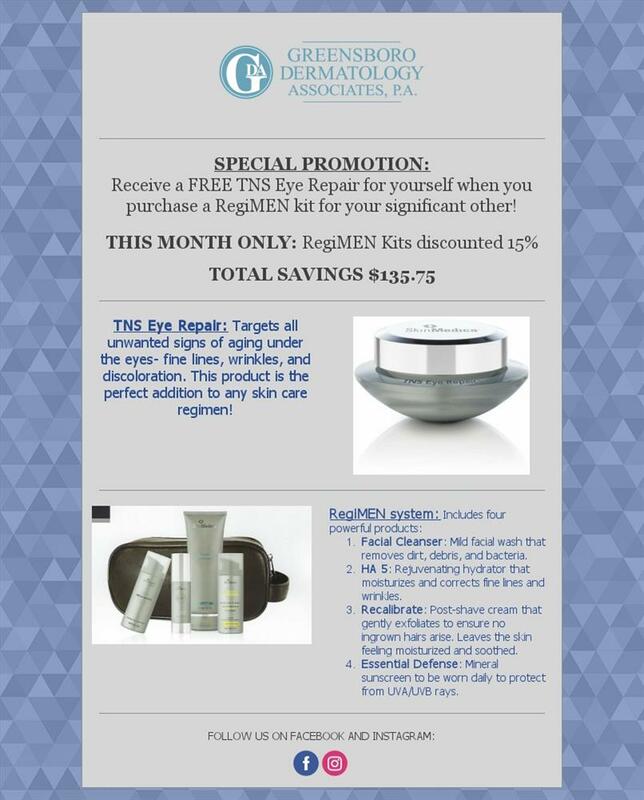 THIS MONTH ONLY, RegiMEN Kits are discounted 15% Also, receive a FREE TNS Eye Repair for yourself when you purchase a RegiMen kit for your significant other. Facial Cleanser: Mild facial wash that removes dirt, debris, and bacteria. HA 5: Rejuvenating hydrator that moisturizes and corrects fine lines and wrinkles. Recalibrate: Post-shave cream that gently exfoliates to ensure no ingrown hairs arise. Leaves the skin feeling moisturized and soothed.